Chase Field was the first baseball stadium in the world to have natural grass along with a retractable roof. 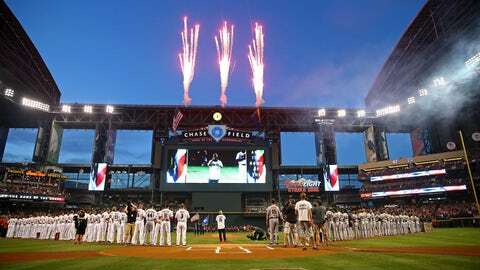 PHOENIX — Chase Field, home of the Diamondbacks, ranked No. 6 in Stadium Journey’s 2015 MLB ballpark experience rankings. The annual survey, to determine the best overall fan experience, ranks ballparks on food and beverage selection, overall atmosphere, neighborhood, fans, accessibility (including parking, traffic, restrooms, handicap accommodations), return on investment and special features. Oriole Park at Camden Yards ranks at the top of the list for the second year in a row, followed by PNC Park (Pittsburgh), Busch Stadium (St. Louis), Fenway Park (Boston), Wrigley Field (Chicago Cubs) and Chase Field. Chase has a "Fanfare" score of 4.6 on a scale of 1 to 5 and scored a perfect five stars on food and beverage, neighborhood, accessibility, return on investment and extras. While there’s not a lot that changes year-to-year at Chase Field, not a lot really needs to change. The overall baseball experience is still one of the best there is. As things need to be replaced or upgraded, the Diamondbacks do it. You’re not going to run into something that doesn’t work or looks outdated at Chase Field. Enough can’t be said for how nice everyone is there as well, from the ushers all the way up the organization staff. The team is definitely run by the right people, and it shows in the game day experience.